Should I Use A Punch Or Paper Drill For Making Tags? Making holes in tags is something was a finishing job that I did frequently on the ancient drilling machine I operated in the print shop where I worked many years ago. I had never seen a punch for this task other than the familiar 3-hole desktop type for a few sheets of bond paper at a time. High capacity hole punches like the FP-1XLS are far different from those familiar wedge handled dinosaurs we have all seen. These punches while very convenient and low cost, have one caveat when creating holes in tags and card stocks. 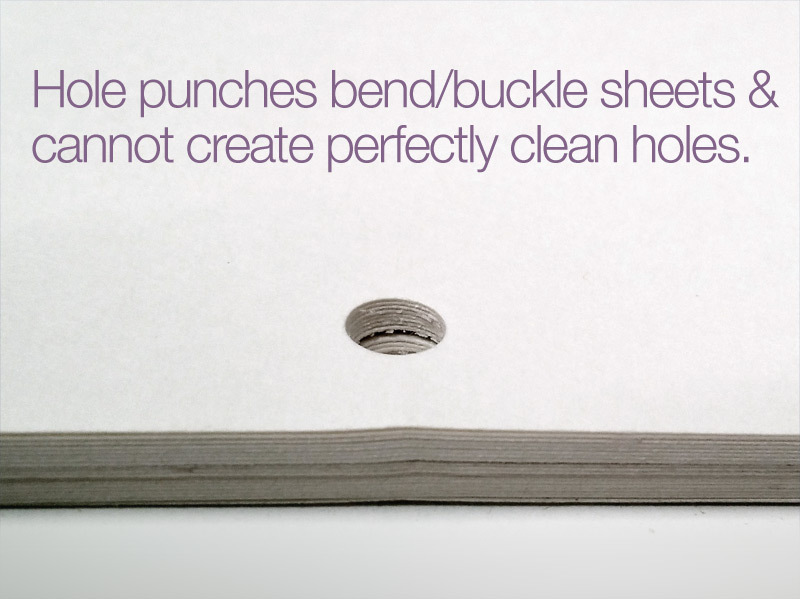 Since the punch bit is not spinning, the paper undergoes some heavy stress as it is forced down through the sheets. Card stocks will buckle or bend from the stress and depending on the colors of your tags (and how much of a neat freak you are) this may not be desirable in some situations. Additionally, punched holes can sometimes look not as clean as drilled ones. The picture above shows white, 67 Lb. Bristol card stock punched on the FP-1B punch. The difference between these a traditional powered graphic arts drill press is mainly in the rotation of the bit – the spinning of a paper drill bit allows for a clean hole with very little stress to the paper and no buckling. So does this rule these hole punches out for use on tags and other card stocks? No, not at all. Saving money with a punch versus a drill will have some quality trade-offs: you just need to decide how clean you need your punched sheets to be. Do you have any tips on punching holes in tags? Please share in the comments below. It’s a frequent question that we get several times a week: someone calls in and needs help identifying the correct drill bits for their paper drill. We usually have to go through a series of questions to get to the brand and style of the bit, then it comes down to capacity and diameter. In order to save you the phone call, chat or email we have created a handy tool to help you determine the correct bit. 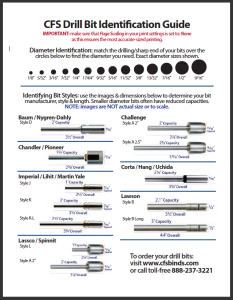 The CFS Drill Bit Identification Guide is a printable PDF sheet that you print out and reference your drill bit to. When printing the guide, make sure that the scaling is set to none, DO NOT reduce it to fit printable area (Ignore scaling & shrink to fit page width) – it must print out in actual size, so you must disable this option. The first step is to identify your drill bit/drill press manufacturer/brand. You can do this by comparing your drill bit to the pictures shown on the guide. Next, you measure the length of the portion that drills through the paper. This measurement determines your bit’s capacity. The final identifying step is to figure out the diameter of the hole you need. If you have an existing drill bit, place it over the diameter identification circles to find a match. That’s all there is to it! We hope you will find this handy guide a great tool for your paper drilling needs. 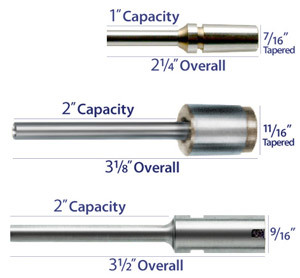 Do you have any tips on determining paper drill bit sizes? Please let us know in the comments below. 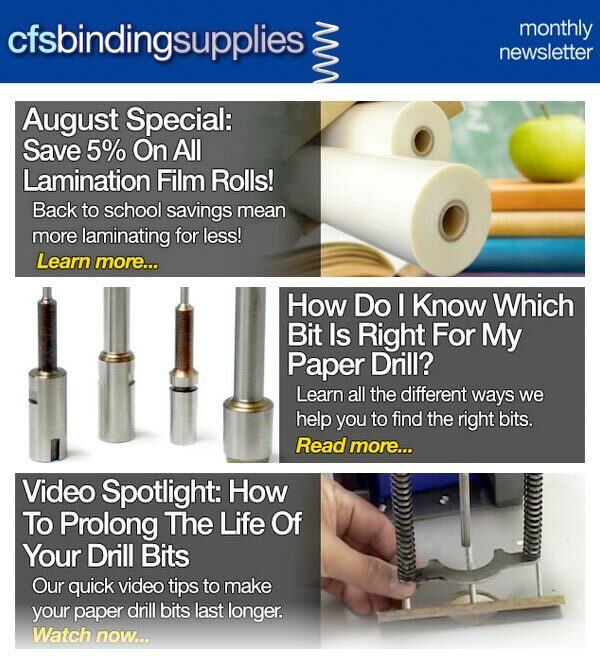 CFS’ August 2015 newsletter showcases a new blog post that shows you all the different ways you can get help to identify paper drill bit styles for your drill. Going along with that article, it seems only fitting to make this month’s selection from the video vault a quick tip list on how to properly care for your paper drill bits. We also thought it’s time for a ‘back to school’ special: we’ve cut the prices on our laminating roll film down by 5% all month long. How Do I Know Which Bit Is Right For My Paper Drill ? Pardon the pun, but sometimes it’s a ‘bit’ difficult to identify the proper style drill bit for a paper drill. It’s a call we get frequently, someone has purchased or inherited an older paper drilling machine – or perhaps the last person to order new paper drill bits has left the company. Finding the correct bit can be a challenge, but we’ve created a few ways to ensure you get just what you need. Firstly, you can start with the drill bit manufacturer name – we have sorted all of the bits by the brand of drill. Clicking on the manufacturer name will show you the bits available. 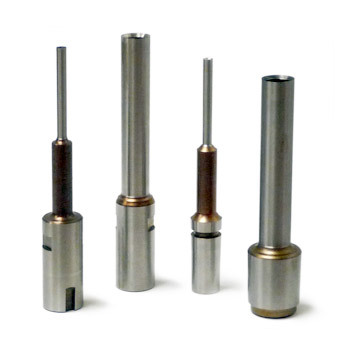 Some manufacturers offer different length bits for specific model capacities. Then there is always the visual – you can view the detailed images of each drill bit style on our website to see if you can match an existing bit. The most important factor is the shape of the shank – the portion that inserts into the drill’s chuck. If you click the bit image on each style’s page you can view a larger version. You can also measure your bit. We’ve taken the guesswork out of determining the key dimensions of each bit style. You can see the measurements in inches by clicking each drill bit image. Often times, determining the diameter of your bits can be tricky. 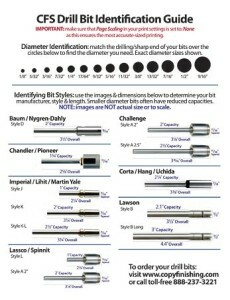 For this and all of your drill bit identification needs above we have created our CFS Paper Drill Bit Identification Guide. This handy PDF file can be printed so that you can place your bit over the chart’s diameter circles. It’s crucial when printing the guide that you ensure any printer page scaling is set to NONE – that way the diameters print out at actual size. Lastly, if you can’t seem to locate your drill’s bits you can always reach out, just contact us and we will do everything we can to get you the replacement drill bits you need. Do you have any tips on other ways to identify drill bit styles or sizes? Please share in th comments below. It seems so long ago when we wrote our very first blog post on 5 Ways To Extend The Life Of Your Drill Bits and we’ve covered quite a large number of topics since then. Yet paper drill bits continue to be a very popular subject. Lately, we have been getting quite a few phone calls on paper drill bit maintenance as well as questions on how to make the drill bits stay sharp and last longer. A great resource that we point these callers to is our Caring For Your Drill Bits video. This video, full of useful tips, will definitely help you to extend the life of your drill bits.